Call for papers and/or panels for the section on the "Critical Relations between International Relations and Islam" chaired by Nassef Manabilang Adiong. Organized by the Standing Group on International Relations (European International Studies Association) in cooperation with the Institute of International Relations, University of Warsaw and the Polish Association for International Studies. Application period has been extended until 28 February 2013. For a very long time, the Muslim world was regarded as an outsider from the cultural and normative pretext and state relations of the West. Even during the reign of the Ottoman Empire, scholars of International Relations (IR) excluded her as a subordinated stealth ally or non-ally of major European powers. The shift from Bush to Obama in their foreign policies toward the Muslim world, Imam Khamenei’s position about nuclear weapons, transitional political elites such as Egypt’s Pres. Morsi (Muslim Brotherhood) and Tunisia’s PM Jebali (Ennahda Movement), and Malaysia and Indonesia’s rising Salafi (political) movements are few examples that it is now apparent that there is an imperative motivation why Islamic discourses gradually dominate contemporary international relations, and how it affects the West in a theory-praxis spectrum. The objectives of this section are to show juxtaposed positions of mutual or diverse perceptions between IR and Islam based on conceived notions of contested conceptions like sovereignty, nation-state, human rights, gender, etc., and place Islam in the epitome of global discourse of international relations as a major causal factor that affect the behaviors of actors in the international system. 1. How International Relations scholars perceived the field of Islam since the Interwar period (1919-39) until now? 2. How Islamic scholars (Muslims or non-Muslims) perceived the field of IR since the Interwar period until now? - Towards the Idea of an Islamic IR theory? - Probable fifth IR’s Great Debate: An Islamic (religious and cultural) challenge to the mainstream IR paradigms and theories? - Examination of current positions, status, and progress of scholars, practitioners, and students engaged in the research of both IR and Islamic Studies. - Revisiting integration studies of Muslim migrants in Europe and their present political climates in shaping EU’s foreign policy. - The Muslim youth and the social media (Google, Facebook, Twitter, etc.) in the Arab Spring process. Abstract of your paper/panel proposal(s) should be 150-200 words. A panel proposal must have a chair, discussant, and 4 to 5 paper presenters. After submitting your proposal, please send a copy of it including an autobiographical statement to info@nassef-m-adiong.com. The closing date for paper and panel proposals is midnight CET on Sunday (24 February 2013). The European International Studies Association (EISA) invites nominations for a competition to judge the Best Ph.D. Student Paper 2012. The main criteria for judging the papers will be outstanding scholarship and originality. Papers may have been presented at a workshop or conference or published during 2012. 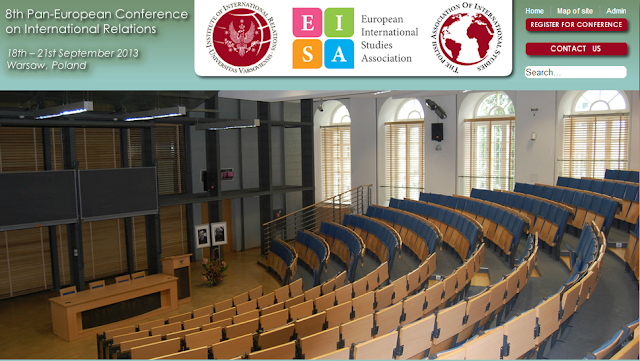 The award will be announced at the upcoming EISA Pan-European Conference in Warsaw, Poland (18-21 September). Nominations and a copy of the paper should be sent to the selection committee chair, Professor Karin Fierke (kf30@st-andrews.ac.uk). The deadline for nominations is 1 May 2013.